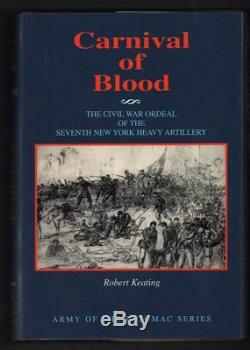 Carnival of Blood: The Civil War ordeal of the Seventh New York Heavy Artillery. Notes: Baltimore, MD: Butternut & Blue, 1998. Limited edition, unnumbered of 1000. Very good, in very good jacket. Slight bump to top edge of spine. Jacket spine has trace of sunning. Hand written note to prior owner from author, Robert Keating laid in. The item "Carnival of Blood The Civil War ordeal of the Seventh New York Heavy Artillery" is in sale since Wednesday, January 13, 2016. This item is in the category "Books\Nonfiction". The seller is "stick_figure_books_abaa" and is located in Inverness, IL. This item can be shipped worldwide.